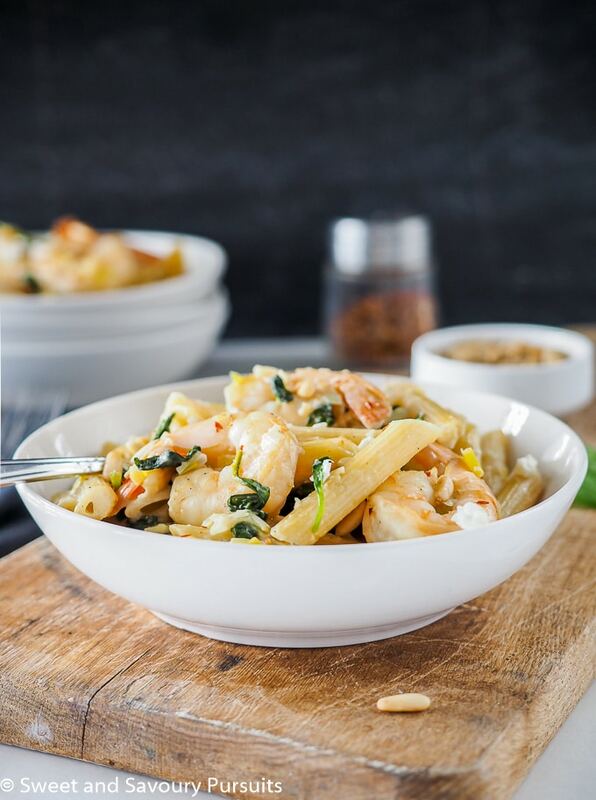 Not only is this Shrimp, Spinach and Goat Cheese Penne an easy and delicious option for a weeknight dinner but it also makes an excellent main for a dinner party. 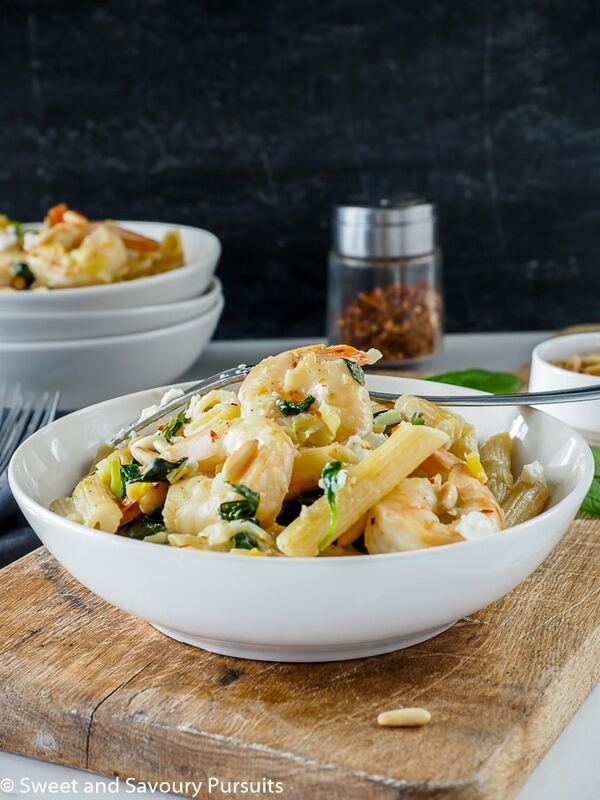 This is one of my favourite pasta dishes, it combines lemony shrimp with creamy goat cheese, some baby spinach and leeks. Toasted pine nuts are thrown in for some added texture and a bit of crunch to the dish. All of the ingredients come together to create a pasta dish full of delicious flavours. 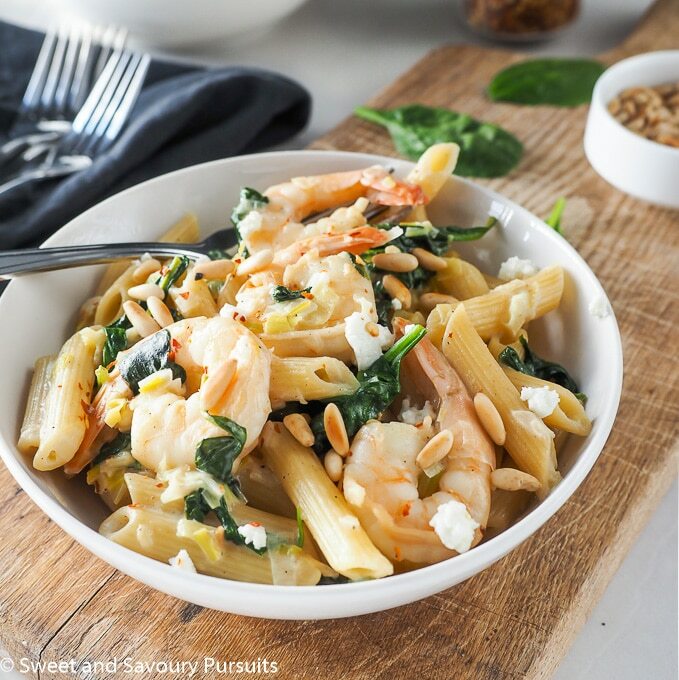 This Shrimp, Spinach and Goat Cheese Penne is perfect as a weeknight dinner. Though the ingredient list might seem a little long, the process is very simple. Here are a few tips when making this dish. First, I think a shorter pasta such as rotini, fusilli or penne is ideal for this dish, but there is no reason you couldn’t use spaghetti or linguini if that’s what you have on hand. Marinate the shrimp right from the beginning of your preparation, this way they will be more flavourful. I highly recommend not skipping this step as the lemon zest adds a really nice brightness to the whole dish. Make sure to choose a large enough skillet so that you can make the entire meal in the same pan, this way you keep dishes to a minimum. If using, toast your pine nuts in the dry skillet to intensify their flavour. If you don’t have pine nuts you could toast slivered almonds. Be careful to keep a close watch on the nuts as you’re toasting them because they can quickly go from perfectly toasted to burnt! Next, saute the leeks and garlic, reserving them in a bowl when they are lightly golden. Now cook the shrimp but remember not to cook them all the way through, they will finish cooking when you combine all the ingredients at the end. Once the shrimp are opaque you can reserve them with the leeks. Add the wine (you could also use chicken or fish stock) to the skillet, scrape the little bits of food (that’s flavour) and add the spinach, once the spinach is wilted you can add the drained pasta (remember to reserve 1/2 cup to 3/4 cup of the pasta cooking liquid) to your skillet along with the shrimp and leeks. Next add the goat cheese and enough of the reserved water to make a thin sauce to coat the pasta. To finish the dish add the pine nuts, extra goat cheese and if you like things spicy, some crushed red pepper flakes will give this dish a little extra kick. Enjoy! 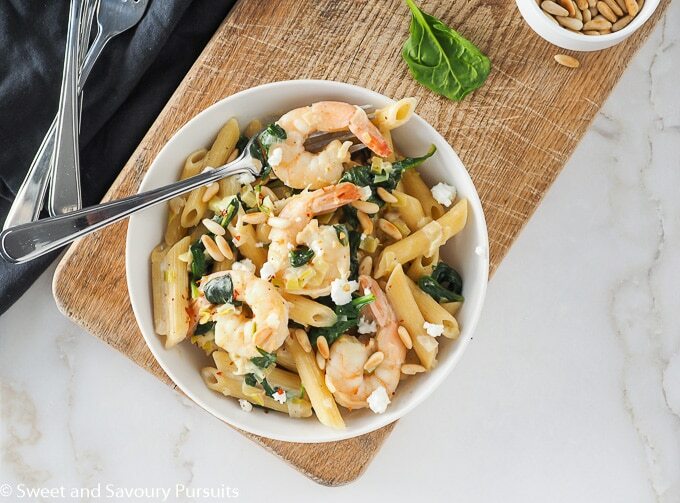 This Shrimp, Spinach and Goat Cheese Penne is not only an easy and delicious option for a weeknight dinner but also makes an excellent main for a dinner party. Toss the shrimp with 1 teaspoon of olive oil, the grated lemon zest and 1/4 tsp. each of the salt and pepper. Marinate for 20 minutes. In a large dry skillet toast the pine nuts until fragrant and golden coloured. Remove from skillet. Meanwhile bring a large pot of salted water to a boil; when it's at a roiling boil, add the pasta and cook according to package directions. In skillet, over medium heat, add 1 tablespoon each of the butter and olive oil. Add leeks and cook for a couple of minutes, add garlic and keep cooking until leeks soften and just start to colour, about 5-6 minutes, season with 1/2 tsp. of salt and pepper and 1/4 tsp. nutmeg (if using). Transfer to bowl and reserve. In the same skillet over medium heat, add the shrimp and cook until just opaque, about 1 minute on each side. Transfer shrimp to bowl. Pour the white wine into the skillet, scraping any browned bits of food from the bottom of the pan with a wooden spoon. Add the spinach and cook until just wilted, about 1-2 minutes. When pasta is cooked, drain it reserving 3/4 cup of the cooking liquid. Add the drained pasta, leeks and the reserved shrimp to the skillet; stir to combine. Add the goat cheese and enough of the reserved cooking liquid to make a sauce that lightly coats the pasta. 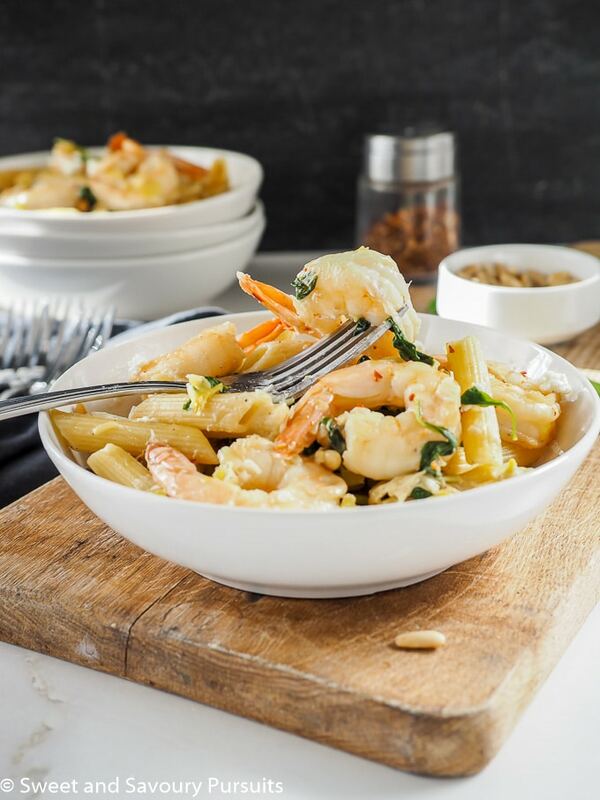 Let simmer over low heat for 2 minutes to finish the shrimp and let the flavours meld. Taste and adjust seasoning to your liking. Add the pine nuts, additional goat cheese if desired and serve with crushed chili flakes on the side. I hope you do, it’s one of my favourite pasta dishes. Thanks! Oh wow, I love penne and goat cheese!! This looks so delicious, I could have that right now! This pasta looks delicious. I love goat cheese and pine nuts in dishes. Can’t wait to try it. Thanks Myrna! I love goat cheese and pine nuts too, I’m sure you’ll love this dish. What a delicious looking meal, can’t wait to make this for my family. I love the ingredients yumm. Very nice flavors and beautiful dish! Thanks so much Lynz, the flavours do work very nicely together!